This graphic organizer is great for bell work, or a whole lesson. 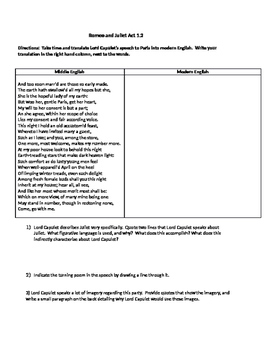 Students must closely read and translate the Middle English into Modern English and analyze various aspects of Lord Capulet's response to Paris (Act 1 Scene 2). The graphic organizer then leads to questions about structure, characterization, author's purpose, and imagery.